So with that in mind it should be clear that if you wish to take your design to the next stage you can spin your own PCB, solder down the LPC1768 and reuse the binary you made with your mbed Microcontroller prototype, you can. The purpose is to show you how you can get your binary into the LPC1768 on your own PCB, and what other things you can do. 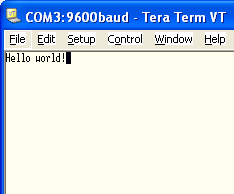 The first thing to do is write a (very) simple program that prints "hello world!" to hyperterminal, and flashes and LED forever. I'll do this on an mbed module first, and then attempt to port it to an LPC1768 on an custom PCB. I'm driving both ends of the LED as I have a PCB for an LPC1768 that i can port the binary to as an experiment, and doing the double ended driving is the simplest way. I have a PCB that my brother has spun for an mbed project (programmable access controller). I have put down an LPC1768 and just enough passive to get it running. We'll now see the steps to go through to get the binary that developmed on the mbed prototype running on this LPC1768. 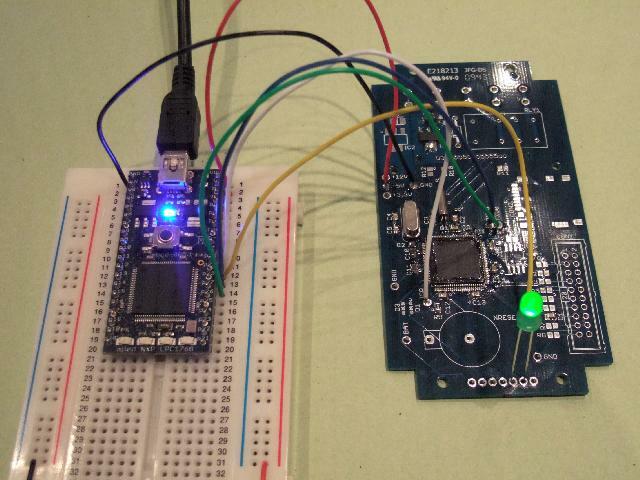 There are two ways to get a binary into the LPC1768; JTAG and the In System Programming (ISP) over a UART using the LPC1768s built-in serial bootloader. 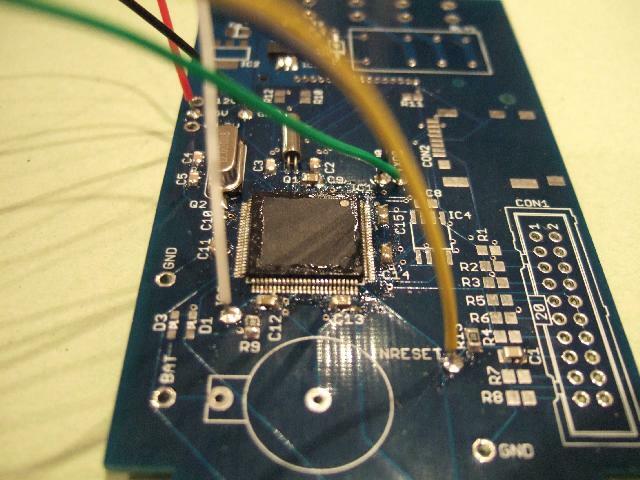 The JTAG method is what you will find on a lot of development boards. It offers many additional features (debug, semihosting, etc) as well as just the ability to load the binary image. Using the JTAG port requires a JTAG "wiggler" to drive the JTAG interface, and some software that knows how to communicate over JTAG and load the binary. With a level shifter you can quite happily connect to it from your computers COM port and use teraterm to type commands to it and see the reply, or use some software to communicates and download binaries. The first stop is to get the LPC1768 on the custom PCB into ISP mode, and communicate with it. To bridge control the pins, and bridge the bootloader serial port to my PC, I will use my mbed as a serial passthrough and to drive the ISP and nReset pins. I'll refer to this arrangement as mbedISP. Use the USB serial port to communicate with the PC, and simply pass characters back and forth between the LPC1768 and the PC via the mbed - Think of it as USB -> RS232+Levelshifter ... and then some..
As the nReset and ISP pins have pullups, they should be driven with an open collector. I will mimic this by using a DigitalInOut, driving as an output of value 0, or as an input with no pull-up. also share a common ground. Wire the custom PCB to the mbed. Build the binary of the code shown. I should be able to type in ISP commands from the LPC1768 manual listed above, and get the expected response. I'll start simple by sending the "?" character which is for autobaud detection - the LPC1768 should reply "Synchronized". First attempt, and it works better than I'd hoped for. I sent the "? ", and immediately got "Synchronized"
I kept it simple, I run commands J (to get the part ID) and K (to get the booloader version. I can now communicate with the LPC1768 in bootloader mode, so it is now time to see if I can use FlashMagic to do the comms for me. I have flash magic installed, it is a nice looking tool, but the first thing I notice is that it only support .HEX files, whereas the mbed compiler only generates .BIN files. http://www.hex2bin.com/bin2hex - Click the link and the download starts! I download the zipfile, extract it into C:\prototype then copy the binary I made earlier "prototype.bin". The first thing I notice is that when I try to convert this, it says it can't open the file, even though I autocompleted the file name. 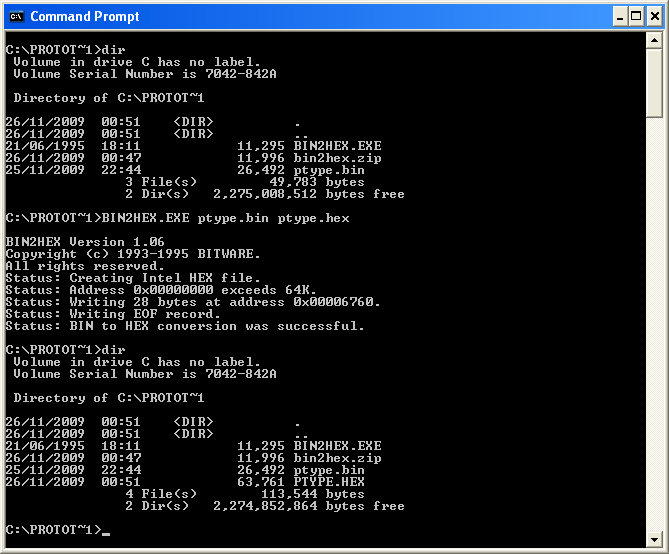 I think this has something to dowith 8.3 files names, so I rename my binary to "ptype.bin" and it works a treat. Hex file : Load the one I just created. The interesting thing here is that it reports the bootloader version I got earlier and the Device ID as a hex number (0x1600f925). before I got 369162533 as a decimal... which happen to match. Great, I am clearly communicating happily with the LPC1768 from Flash Magic. Nothing left but to download... Phut! It is complaining that the device signature does not match the expected. On closer inspection, it looks like I have actually soldered down an LPC2368 not an LPC1768 - the danger of having two almost identical parts to hand. No worries though. I go back to the compiler, and rebuild "prototype.bin", this time selecting the LPC2368 target - You've got to love the way you can choose which architecture to build your binary for with a dropdown menu. Instead of saving it to my mbed, I put it in "c\prototype" saving it as "ptype.bin", go back to my Command Prompt ("DOS", for the over 25's), and re-run BIN2HEX. I reset the mbedISP so that it again awaiting the first character, and go back to Flash Magic, select the target as LPC2368 and try again. the while(1) loop doesn't know download has stopped, so I have to reset manually. Could be solved with a timeout, but it still feels likeI don't have the control I want. The simplifications needed seem obvious. Make ISP and nReset manual with a couple of push buttons, and turn mbedISP into a simple serial passthrough. To put the LPC1768 in ISP mode, press and release nReset while ISP is held low. This is all working very nicely. Now if have access to the nReset and ISP, I can reset the LPC1768 as much as I want, and put it into ISP as I want. The only think to look at now is the speed - it takes forever to download (45 seconds). So if I now chage my prototype program to set the serial port to say 115,200bps and set the mbedISP to do run both serial ports at this speed, we might be able to reduce theprogramming time, and make printf faster. The prototype app is now printing "Hello world" pretty quickly too! Lets see if it will go faster (230,400)... Phut... no.. looks like 115,200bps is as fast as we can go. Still, thats not too shabby. I think we should assume that the target system must provide it's own power. This is a safe way to do it as then we dont have to make any assumptions about it's voltage or current consumption. That way, it would be easy to make a little programming breakout board to post up on BatchPCB. I think this experiment has proven that it is fairly stright forward to program an LPC1768 (or LPC2368, as it turns out) via ISP when it is on yout own PCB. I hope this page will serve as a good reference of how to go about this, please leave comments and feedback, and i'll tweek this page up as needed. mbedISP - The mbedISP program. It's simple enough, but here is is anyway. Liking this, but all the mBed itself is a USB->Serial TTL cable, useful all the same. You can Hack a Nokia DKU-5 cable (~£3) to do the same thing. Next we need to turn the mBed into a JTAG itself. Yup, you are right mbed is now just a USB->Serial converter. I was hoping to make it control the reset and ISP lines, but as you saw, that turned out to be a bad idea. The essence of this page is just to demonstrate the process, and give some confidence that there is a route to reuse the binary on a custom PCB. My assumption is also that if you needed to use all the extra features that JTAG gives, you'd be doing "product development" rather than "rapid prototyping" using a traditional Dev board, JTAG wiggler and offline compiler, rather than mbed. They might not be valid assumptions, I'm happy to be told why :-) - afterall this is still a bit experimental. So the intention that this is an experimental and educational tool? If this is the case, could there be some merit in having a JTAG (even in a limited form) for educational purposes, for users using the mbed to learn Embedded Programming, using a JTAG can be a component of that education. I have been struggling with this same general problem. I have several potential products but the thing they all have in common is that the user is not an expert. They are seniors and kids so any update must be fairly simple. I think Flashmagic is too compllicated. The bootloader approach on Sparkfun tutorial is great because all it required is a file on a sd card. I tried to implement that on a program that I developed under Crossworks for Arm but it turned out to be too complicated for me to debug. I was hoping to just use mbed but it no one has yet done that bootloader I just mentioned. It would be great if someone did. We all seem to be inching towards it. I am impressed at how much has been done already by you mbed people. This is a truely excellent guide and has got me really enthused about the awesomeness of the mbed. Many thanks for taking the time to write this up. I was looking for information like that to go from the mbed to a custom board. This gives me more confidence now to go to the next step. Just stumbled upon this write up - good stuff! Are there any plans to add a suitable ISP pin header to the Prototype2Product schematic (http://mbed.org/projects/cookbook/wiki/Prototype2Product) (hint!) It would also serve as a useful hookup point for those debugging printfs... For the lazy (ahem, time-poor) amongst us, a pinout compatible with the FTDI serial cables (http://apple.clickandbuild.com/cnb/shop/ftdichip?op=catalogue-products-null&prodCategoryID=105&title=USB-TTL+0.1%94+Socket) would be very cool. On the same subject, the 10 pin mini JTAG/SW connector would be a welcome addition (or replacement) on the Prototype2Product schematic, for anyone wishing to re-create Jason's setup (http://mbed.org/users/tecnosys/notebook/lpc1768-programming-via-10pin-jtagsw/). The 20-pin JTAG header takes up a lot of space on a board - too much when you're trying to minimise the cost of a PCB production run! I can envision creating a few different versions; offering options like mini-JTAG, built-in ethernet support, and multiple USB ports - one for Serial via FTDI, and one connected to the USB pins of the 1768. Any other requests, just let me know! I'm not sure I read over it somewhere or what I did read I didn't follow. Can someone make up a bare metal schematic with BOM using the LPC1768 chip ? The reference schematic to me doesn't make sense with this "IC2". When I look at the pictures of the custom PCB above I see the microcontroller, a few resistors and a frequency chip. But looking at the schematic I see the frequency chip connected to "IC2" but nothing connected to the LPC1768 ? Hi Frank, the ref schematic is not the complete mbed schematic. The mbed interface chip (aka magic chip) is missing. In fact IC2 and LPC1768 are the same. 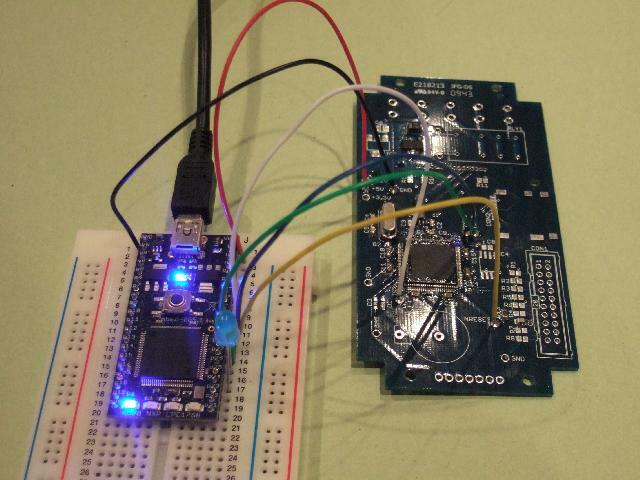 The IF chip and the LPC1768 share the same 12 MHz clock on the mbed. There are plenty of example schematics on the net of bare metal LPC1768 boards. For example the Keil MCB1700 is available [[http://www.keil.com/mcb1700/mcb1700-schematics.pdf | here]]. Does anyone know of a bin2hex converter that can convert files bigger than 64k? My mistake - bin2hex will convert bigger files if you add /2 after the binary file name. Now works great with my 410k file to a LPC1767. I would like to use a process like this that uses the bootloader. However, this discussion seems a lot about how NOT to do things! It seems for us novices that a simpler and more practical tutorial would be appropriate. My thoughts started along the line of mounting a ISP jumper on my custom PCB and then a push button to initiate programming. The jumper would be used temporarilly to set the ISP pin low while programming. The pushbutton would set the reset low and when released set it back high. This would initiate the bootload from the PC using FlashMagic. Am I correct in assuming that that the bootloader wont work across the USB on the LPC1768? This would cetainly simplify the cabling. We could just use a FTDI chip on the custom board to access the PC via USB since they dont tend to have serial ports. But this is reallly ugly because we need pushbuttons, jumpers and a FTDI chip -- lots of precious board real estate. We should think this through and find the best solution without using JTAG. We may end up with JTAG being the easiest solution in terms of real estate and board-mounted parts. Why can we get the exact functionality we have with the mbed with our custom board? We would add a USB connector that attaches to the PC. A button would perform the reset. How would this be implemented? does not work. I tried to reset the LPC1768 (put reset to ground) and still, I am unable to see the Hello World message. Am I missing a step? After programming? I think your program is working but you either need to use the USB serial library or use a different UART (e.g. p9,p10) and an FTDI chip to convert to USB or use TTL serial. I suggest you recompile your code and add in a flashing LED so you can see the program execute. 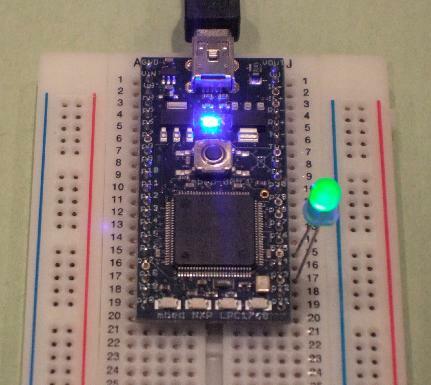 1- we compile a LED exemple using Mbed compiler. 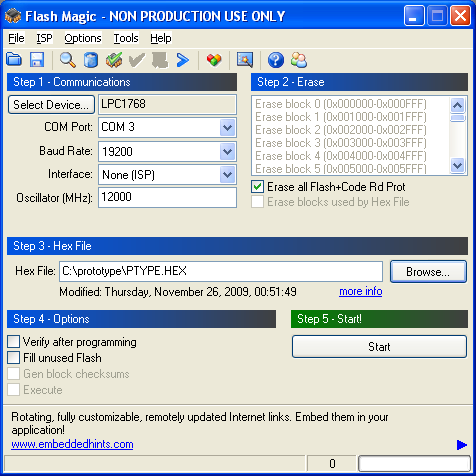 3-we use Flash Magic to download the program into the lpc using FTDI cable. 4-once it s finished from programming we make a reset. 5- now we should see the led blinking but it does not work. Considering you program using ISP that should mean it is running its clock fine, so your code should work. I do assume you actually connected your LED to p9. Thanks for your code. I just programme it on my chip. Then, I verify teh memory content and it is the same as the code. So, no dougt, the chip was programmed succesfully. However, the led does not blink. as was proposed in the forum. When compiling with bin2hex and commparing with your file, I see they are not the same. In my case, each line starts with :2 and in your case it starts with :1. Also, my lines are longer. However, one can see that both code is somehow the same. I was using bin2hex. What are you using? I am using objcopy, to be specific avr-objcopy. Here is another one: http://mbed.org/forum/electronics/topic/3291/?page=3#comment-17011. I do use it on vista, but I expect it then also to work on 7. The :10 means your lines will have 16 hex values. Lines starting with :20 will have 32 hex values. This the regular intel hex format. So the hex file looks ok, which is also confirmed by the fact that your code runs. Ok, I made another board and it works fine. You are right, both HEX files works now. What are the advantages of using another chip? Does lpc1768 chip need oscillator to run? I saw 2 oscillators on that picture, which pin do they connect to ? and why 2 oscillators? One looks like the 32.xxxkHz oscillator used for the RTC, if you dont want to use the RTC you shouldnt need it. Other one is main clock source. AFAIK you can also run from internal oscillator, but for many functions you will need a more accurate clock. Thank you. Does mbed module use external main clock? I looked at the schematics. It looks like a 50Mhz clock goes into the LPC1768, but that pin is for ethernet i think. The other one is 12Mhz clock for RTC. 12MHz is the main clock for the LPC1768 (and the magic chip). Internally a PLL brings it to the 96MHz the mbed runs at. There is indeed also a 50MHz oscillator I didnt realise there was, indeed for ethernet. And finally a 32kHz crystal for the RTC (page 3 of mbed schematic, left bottom. It is a bit hidden). Correct me if Im wrong, On page 3 of the mbed schematic, X1 is external clock source pin which is 12 Mhz, RTCx1 and RTCx2 is for the RTC clock, which is provided by a chip called FC-135. Thanks for your help again, me and my team is doing senior design for college. Thanks all for the posts. I'm working with the FRDM-KL25Z board, and was thinking that the "open SDA" components - the second USB port, K20 "magic chip" and other stuff from page 4 of the schematic would be usefull as a programming dongle, no? The inteface signal list between dongle and target is short at 5 and there's no reason to devote space to this stuff on a production target. edit - should have read the manual because it looks like they have thought of this already. Section 5.2. of FRDM-KL25Z User's Manual shows how to use the FRDM board to program off-board MCUs. 1) The very first time when I connect the board, I press the switch 1 and I am able to dumb the lpc11u35_lpc1768_if_mbed.bin file into the 11U35. 2) I, then, power toggle it by removing and reattaching the USB cable. Now I can see the mBed drive in my device manager. I keep the switch 2 pressed, open this drive and load my compiled code in it. I keep the switch pressed until then. 3) Now I release the switch, the code starts running but the mBed drive and the COM port vanish from my device manager. 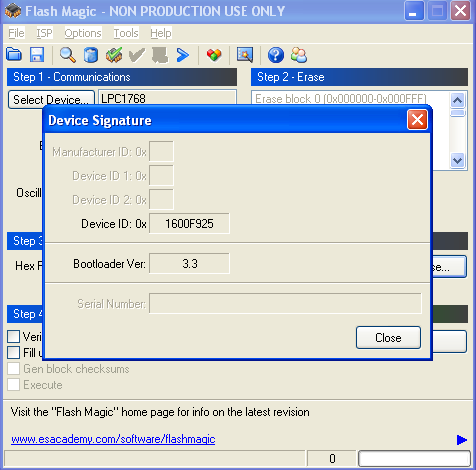 I was able to read the device signature but got the message "Unable to communicate (transmit/receive) when tried to download the HEX file to the target board (LPCExpresso) by Flash Magic. Please suggest! Hello I want to use mbed codes for USBHID in my own hardware (nxp lpc1768). When I use mbed board, computer recognizes the incoming usb and I can communicate with the board via usb, but when I use my own board, the computer returns an error indicating that the incomming usb is not recognized. What is the problem? Do I need to develop some drivers for it? Thank you. I would like to build a custom board with the FRDM-K64F (MK64FN1M0VLL12) with only a single MCU chip. Has anyone tried this and what pitfalls would I need to avoid in the hardware design? 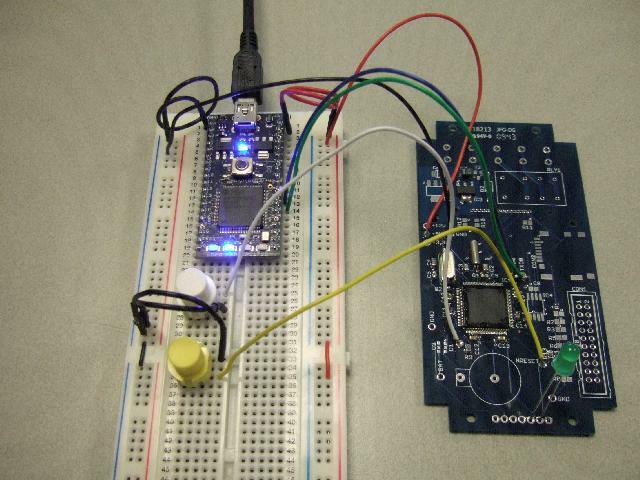 The first program with the bootloader code would need to be downloaded with JTAG or a second FRDM-K64F board. The K64F USB port does not support serial natively without mbed libraries (USBserial). This means the bootloader code needs to copy the program to intermediate Flash memory sectors as received over USB serial, and then write the program to the Flash memory boot sectors. hi, I have a doubt. I just started with ARMmbed. There are 100s of boards provided, all have same type of programming, we just need to choose one specific board. I generated two codes one for teensy board other for lpc1768 board and exported to keil. Now all of the files are almost same. But the doubt is that what makes all the difference for example, if I write a code for tennsy board what changes at architecture level and/or in code are required/done that the same code starts working on some different board, say on lpc1768 board.